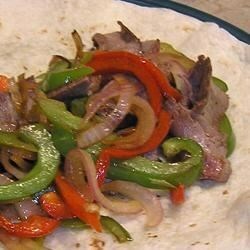 "These yummy fajitas have an unexpected flavor you'll be sure to love! Serve with tortillas and your favorite fajita toppings." Combine the steak, tequila, and lime juice in a plastic bag; marinate in the refrigerator for 2 hours. Discard the marinade. Grill steak until no longer pink on the inside, about 8 minutes per side. Remove from grill and slice into 1/4-inch strips. Arrange strips on a serving plate. Heat the oil in a skillet over medium heat. Add the liquid smoke, Worcestershire sauce, pepper, salt, and paprika to the oil and stir. When the mixture is hot, add the onions and peppers and cook until the peppers are tender. Pour the mixture over the steak strips and serve immediately.